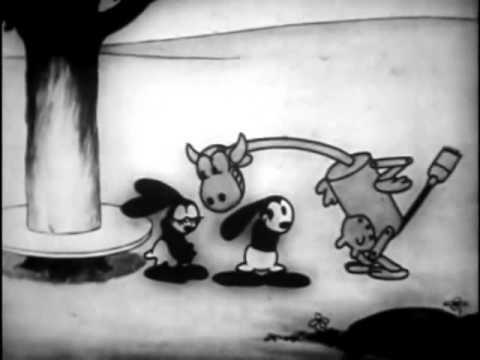 In his fifth film Oswald has a mechanical cow to deliver milk with. When his girlfriend gets kidnapped by a mob of gangsters, the cow helps him to rescue her. The gangsters come to a surprisingly cruel end, when they fall off a cliff and are eaten by sharks. The cow behaves anything but mechanical. On the contrary, it is very rubbery, and even lazy and sleepy in the first scene, and its animation is not different from that of any of the other characters. It happens I was looking at this short just last weekend. I’m most impressed by just how well it’s animated; compared to the contemporary cartoons by the other studios there’s a smoothness and a flow to the animation that, for example, the Fleischers couldn’t match. I was also surprised how little the mechanical nature of the cow is relevant. If it were a live cow, not very much of the plot would be different. The jokes about, like, swapping the cow’s head and tail would read a bit more disturbing, but not so out of line with other 20s and 30s cartoons.